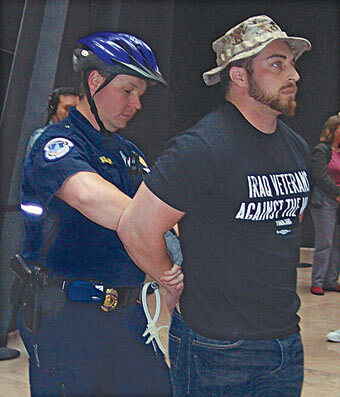 In Support of Adam Kokesh and Civil Disobedience | Dude, Where's My Freedom? ← Institute for Energy Research | Earth Day and Capitalism. Posted on May 6, 2013	by Dude Where's My Freedom? Libertarian activist Adam Kokesh is in the planning stages of a pro-gun protest that has many people (including self-identified libertarians, and other pro-gun conservatives) quite upset, worried, concerned, and generally shitting their pants. Well, it’s not so much a protest as it is a conscious act of civil disobedience. According to the event’s Facebook page, he plans on rallying over 1,000 gun owners to meet in Arlington, VA for a march into and around Washington, DC while open-carrying their firearms. Possessing firearms is illegal in DC, which is what makes this an act of civil disobedience – that it is occurring in open defiance of unjust and oppressive laws. I would like to state that although I will not be attending, I am in full and complete support of this march and its stated ideals. There has been quite a lot of backlash on the Facebook page and in the comments section of any article about this march, and I would like to take a few moments to address two of the most common objections. 1. This is illegal! By doing illegal things, we only prove the government right! All true acts of civil disobedience are illegal. Laws that are unjust and violate our natural rights (as well as the US Constitution) are no laws at all, and you have no moral obligation to obey them. In fact, you have a moral obligation to break them if doing so is the only way you can exercise your natural rights. Nearly all of the historical activists who we are brought up to revere broke the law on multiple occasions in order to take a stand against a corrupt power structure. The tradition of defying the government to take a stand for freedom dates as far back as the Old Testament, when Moses killed an Egyptian overseer. Figures our culture worships as heroes including George Washington, Harriet Tubman, Gandhi, Martin Luther King, and Nelson Mandela all violated the law nearly constantly. This did not, in fact, prove how dangerous and wrong they were, but rather how committed they were to fighting for what was right. Let me repeat: There is no moral obligation to obey an unjust law. 2. This event is a perfect target for a false-flag attack by government agents or statist infiltrators! While this is true, using this as an excuse to not have an event would result in not having any events ever. Might government agent-provocateurs or OWS-affiliated communists show up to this march and start firing shots? Maybe. Of course, that hasn’t happened yet at any open-carry protest, tea party rally, occupy wall street camp, NRA meeting, or anything else. In fact, just this weekend, the NRA held its yearly convention in Houston, TX. Over 70,000 people showed up to advocate that responsible gun ownership benefits society. These people belonged to a group that the government is openly hostile towards in the middle of a raging emotional debate about gun control. This event had far more media coverage, focus, and attention than a libertarian 1,000-man protest could ever dream of. And yet, not a single shot was fired. 70,000 responsible adults (and some children!!!) gathered together with guns everywhere, and nobody died. This is the exact point that the NRA(and Adam Kokesh) is trying to prove – that guns do not automatically result in deaths. Personally, I would think that if someone was planning a false-flag attack, they’d do it at a big deal, well known event such as the NRA convention, and not at Adam Kokesh’s open-carry protest. It is my belief that Adam’s protest is an excellent idea. It serves to prove a valid and necessary point that gun owners are not evil and dangerous – the government is. Many of the criticisms of this event are ridiculous if exposed to any amount of serious intellectual scrutiny. It is one thing to think that this event will not be successful, that is entirely possible. But to whine and complain and agitate for it to not even take place is defeatist. Sorry, but writing your Congressman is not going to solve our problems. Adam is planning to engage in a truly heroic act of civil disobedience at great personal risk, and deserves our praise and admiration. This entry was posted in News Commentary and tagged Adam Kokesh, civil disobedience, gun control, gun rights, natural rights, open carry. Bookmark the permalink. Thanks for sharing this piece. If you learn any more about what follows, would you mind keeping us posted? I stand in support of Adam Kokesh and hope to be able to go! Armed with a camera! Our brothers generally are not out to get us. The small fraction of our brothers who call themselves the government; unfortunately, are. While I cannot physically attend due to both the inability to physically march as far as they want and the simple fact that the cost to travel is prohibitive I do hope that those attending understand this cannot be about changing laws. But rather about changing minds and potentially even being the “first shot” in a bloodless coupe of minds! I feel the we really need to take our rights and freedom back from our so called government that is supposed to protect us. I don’t think they ever will. We need to take our country back from the politicians, foreigners, and the evil men and women that say they are there to protect us, but really don’t. Its very sad. It sickens me to see all this crap that’s going on. And having the politicians think they can get away with murder.